QLD Poetry Festival is fast approaching (August 23 – 25) and in the lead up to the event, I have been lucky enough to have been given the job of chatting to some of the festival artists. First up in my interview series, I chat with winner of the Australian Poetry Slam, CJ Bowerbird. You were the winner of last year’s Australian Poetry Slam. How has this experience changed your life? Winning the Australian Poetry Slam threatens to ruin my life as it currently exists. I have always written creatively in my spare time, the little spare time that exists between having a family and a non-creative career. But it is only in recent years I have shared my work with live audiences. And I love it! It is the performance aspect of spoken word that particularly appeals to me. Winning the Australian Poetry Slam has given me opportunities to break out of the strictures of slam poetry to develop longer, more theatrical pieces. These have been well received by audiences in Australia and China, encouraging me to write and perform more. Writing creatively does not necessarily fit well with a balanced home life or a regular 9-to-5 job. Now I have been given a taste, though, I am hooked. Through exploring concepts and situations creatively, I am re-discovering things about myself and about others I did not realise I knew. I am trying to find ways to continue developing as a writer and performer without risking everything I already have. And I believe I am slowly, blissfully losing my mind. I know what you mean about balance. I have come to think it’s almost impossible… there’s always a sense of something toppling. But if the slow losing of the mind helps the process of discovery, then let the unraveling begin! I am really excited to hear you perform some of the longer works you have been working on. The opportunity to perform this type of work in China must have been incredibly exciting. What will stay with you from this trip? Taking part in the Bookworm International Literary Festival in China was tremendously rewarding and satisfying. I performed my 45 minute piece ‘Meta’ four times, in three different cities. The audiences varied from diplomats and ex-pats to Chinese university students. One of the strongest lessons I gained from this trip was the power of performance as a complete activity. While some of the attendees at my shows reacted to my words, others were strongly moved by my actions. This variety was reinforced by the fact English language ability varied through the audience. It was very gratifying to have the freedom to engage with people in different ways. That said, it was the conversations I had which focussed on the words that were most satisfying. These conversations often led in unexpected directions, as others found things in my work I didn’t realise were there. Is it that ‘sense of discovery’ that keeps you eager to hit the stage? 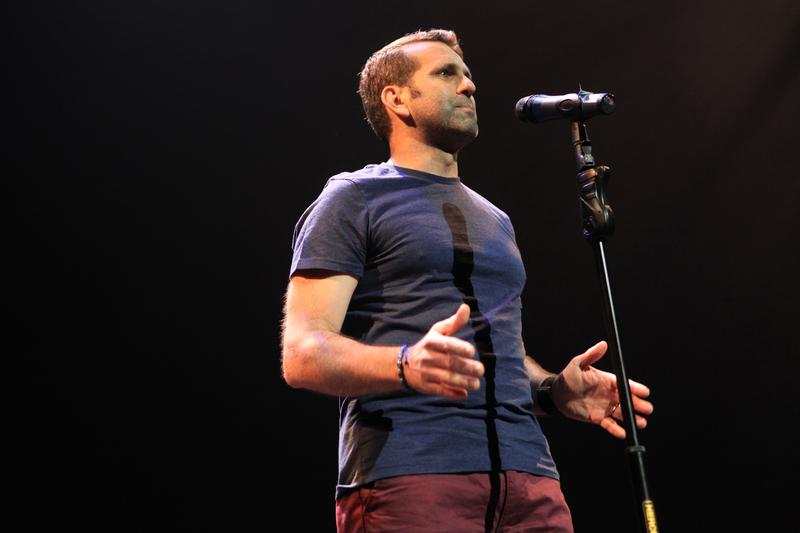 And speaking of hitting the stage, what can audiences expect from you at QPF 2013? It is the sense of discovery that keeps me writing. The more I write, the more I learn about myself. It is the thrill of connection that keeps me eager to perform, the feeling of shared experiences and common emotions. These are the two constants I find in performance poetry – learning and sharing. I will be doing two 15-minute performances for QPF. For one, I am planning a conventional set of poems. For the other, I will put together more of a themed performance, where the poems link together to offer a more complete narrative. I have a bit of a love and loss story arc I am working on that should be ready for the festival. To finish up, what are you most looking forward to at QPF? Are there any sessions, or artists that have really peaked your interest? To be vague and general: everything and everyone. Winning the Australian Poetry Slam has allowed me to attend several festivals this year and meeting other writers and performers has definitely been the highlight of every one of them. More specifically, TT.0 is someone whose work I have followed for some time. I am looking forward to hearing the work of Canadians John Paul Fiorentino and Paul Vermeesch. I have recently started following them on Twitter (@stripmaller and @paulvermeesch) and their conversations have caught my attention. I really want to meet Betsy Turcot, having seen a lot of her work online. Catching up with Kelly-lee Hickey, another Australian Poetry Slam winner, and seeing what she is doing now will be a highlight, as will seeing Scott Sandwich. Bertie Blackman will be a standout. I get a thrill out of cross-genre/form collaboration and have had some good experiences hearing contrasting story telling in poetry and in song. Finally, I am really looking forward to meeting you Graham, and catching up with friends on the QPF committee, Scotty Darkwing Dubs and Eleanor Jackson. CJ Bowerbird is the 2013 Australian Poetry Slam Champion. He tells stories through verse and explores what it is to be human. CJ crafts poetry into paper planes of performance, taking audiences on flights through despair and salvation without ever losing his sense of humour.